What would you do if everything you touched told a story? Life for Scarlet hasn’t been easy. Being a 25-year-old criminology student with a tiny Netflix addiction, you’d think life would be simple. Too bad everything she touches induces a series of visions. As Scarlet attempts to avoid her reputation as the crazy, fainting lady, she’s assigned her final project: examine a crime scene with five righteously hot, attractive men. When she accidentally bumps into a crystal ball and triggers a vision, Scarlet believes she can kiss her dream of becoming a criminal investigator goodbye. 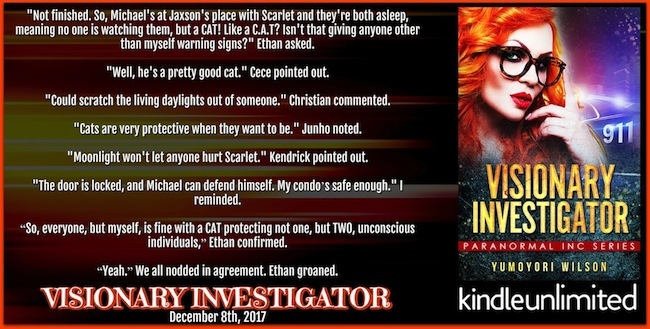 To Scarlet’s surprise, her troublesome gift is about to be her ticket into an apprenticeship with the top private investigator organization in the country. Unfortunately, she missed the memo about the existence of the paranormal race. What’s more shocking? She might be one of them. Every person has a past. Every object holds a tale. Visionary Investigator is a new paranormal reverse harem series. WARNING: M/M action will appear in this book. If it’s not your cup of tea, please DO NOT READ. Recommended for 18+ audience, containing mature sexual content, violence and strong language. 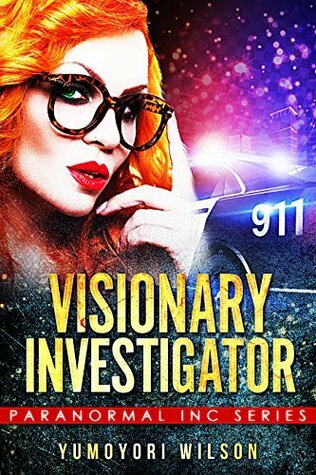 NOTE: VISIONARY INVESTIGATOR is written in CANADIAN ENGLISH – meaning both American and British English is used. The words flew out of my mouth before I regretted them. I could hear Cece giggling on the other end on my phone. “I’d totally take you up on that offer, Miss Sinclair. When I’m not working.” He gave me another seductive smile before his eyes returned to the road; the car moved forward as we made our way to the toll highway entrance. I lifted my phone to my ear, realizing Cece was on the line, still. I hung up the phone, letting it drop on the leather seat as I relaxed. Yup, my best friend is a bad influence.